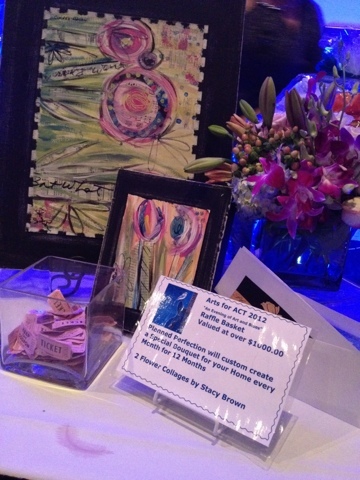 The yearly art auction to benefit the Abuse Counseling and Treatment Center here in Fort Myers was held last night. 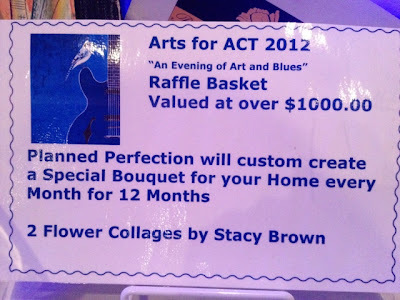 The Arts For Act event offers raffle, silent auction, and active bidding on fantastic pieces of art that have been donated to benefit the cause. raffle. She paired my paintings with a monthly supply of beautiful flower arrangements that would be delivered by a local florist. The little glass jar in front of the display is filled with little pink tickets. I was pleased with the presentation and honored to be a part of the event. Typical of my unorganized and over booked lifestyle, I didn't realize that there was a super cool summer art show going on at Florida Gulf Coast University this month. My husband knew all about it and had, in fact, planned on attending the event on the final night. But, typical of a complete failure of communication on many levels, he didn't tell me about the call for artists. SO, today, when my newly 12 year old daughter was summoned by her classmate (crush) to go skateboarding with him out at FGCU while his mother was working, I learned about the show. It just so happened that the crush's mother is the Gallery Manager. SO, when she was standing in my kitchen, she mentioned the show and said "why didn't you send anything in to the show?" "... Duh.... um.... well.... um...... ", I said. We plucked one of my newest paintings off the wall and put my name on the back of it. There. So, the crush's mom put my canvas in her minivan, borrowed my husband's charcoal lighter metal box thing and drove off. I mentioned before that I'm taking a very well timed class from Flora Bowley. 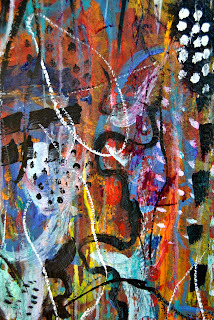 Her artwork appeals to me because of the many complex layers she uses in her artwork. I like layers. I like peeling layers of old paint on antique furniture. I like decorating my house with layer upon layer of whimsical stuff. I like layering my clothing. I like layers. 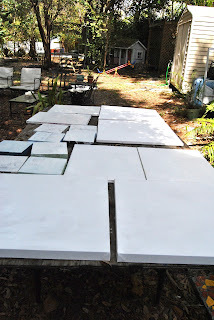 And, given my tendency toward excess, rather than the recommended two canvases, I ended up with several. 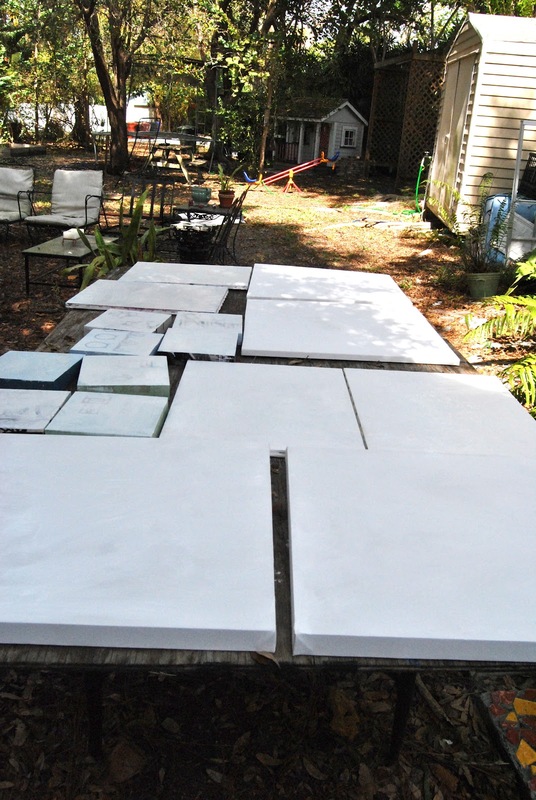 They were just waiting for action and calling out to me, so I decided to work on several canvases at once. It has been actually very helpful because I am not getting attached to any one of them. As Flora recommends, I'm just going with the flow. I do have to admit that I loved my second and third layers best. 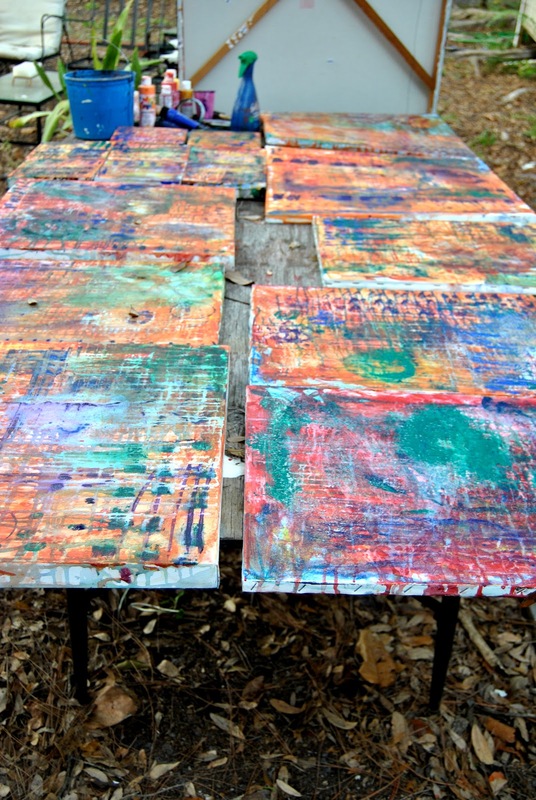 They looked like batik or encaustic works. 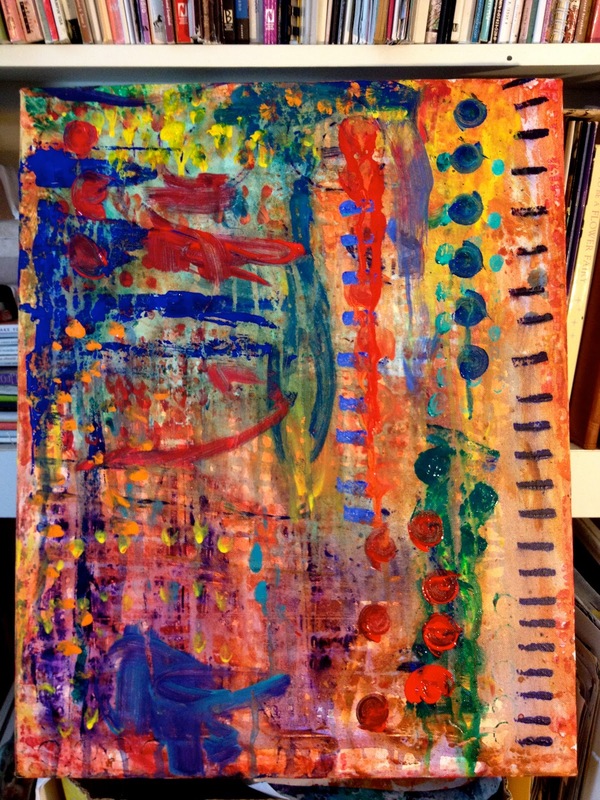 I'm so excited to be participating in Flora Bowley's painting class! It is a sensual, creative journey that was just what I needed. 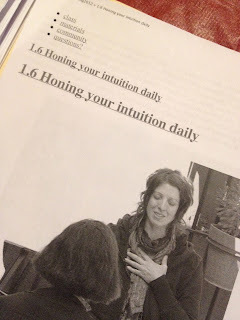 I love the way she integrates honoring the self, thinking positively, embracing play and honoring intuition along with the creative process. It makes total sense, doesn't it? I know for a fact that there is nothing creative or remotely artistic that is coming from my soul when I am obsessing about problems, letting my anxiety get the best of me or feeling down about myself or life. Honoring yourself is so easy... but it takes practice to change a negative habit of any type. 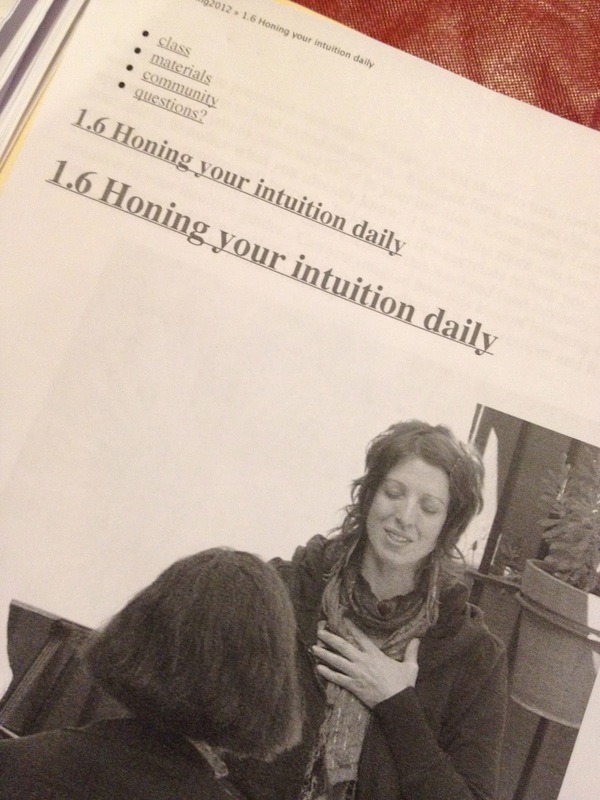 My intuition is strong and always has been. When I pay attention to it, I am always headed in the right direction. Practicing yoga and meditation, exercising, having fun and listening to music daily is the only way to live. Thanks for a very well timed reminder, Flora! Let's make some art! OK.... 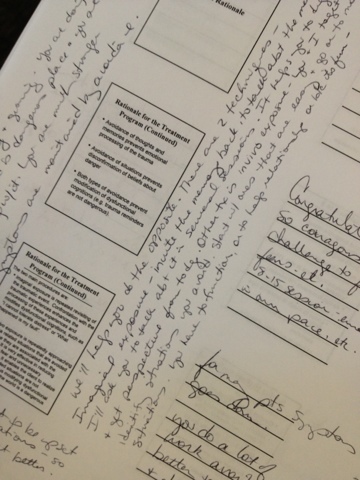 So, I'm distractible.... Even when I'm at my "real job", thoughts of gold sparkly paint and rearranging furniture and ways to decorate and paint are dancing through my head. It's what I really want to do, of course. Can you say ADHD? Here in Southwest Florida, it's about 75 degrees now. We like to enjoy the weather and eat outside often. So, I found these great new seat cushions for my outdoor furniture at Old Time Pottery. They are apple green and I am very pleased to replace my old, weather worn burnt orange cushions. Guests will no longer have to sit on molded, dirty, sun faded, squirrel torn and dog haired outdoor cushions when we have our outdoor pizza oven parties. I have promised myself to take care of these cushions now and put them in our little storage shed so the elements won't destroy them before next season. I decided that the new cushions weren't enough.. as good looking as they are.. and that additional little pillows were necessary. Instead of buying them, I decided to paint cushions that I already had that were also molded, dirty, sun faded, squirrel torn and dog haired. I did not use fabric paint, but regular acrylic paint. While they are certainly stiff, I think they will do just fine. Here are the before, during and after photos... I need to take a picture of the newly painted cushions on the new apple green cushions for the full effect. But, take my word for it.... It is a much improved face lift on the outdoor furniture.... and it was a fun distraction.